The Carr Fire in Shasta County is the 7th most destructive fire in California history, killing at least 6 people and destroying 2,546 structures, including homes and businesses. And that’s just 1 of 17 “uncontained” wildfires up and down California right now. In 2017, there were 9,133 separate wildfires in California; so far in 2018, there have been 4,457 separate wildfires in the formerly Golden State (now the “Burning Up State”). Do you accept this? If not, why do “environmentalist” politicians (known mostly as Democrats)? It used to be that responsible politicians believed Smokey Bear’s reality-based message, “Only you can prevent forest fires.” But now, too many “progressive” politicians silently excuse evil pyromaniacs and negligent transients, and publicly blame “climate change” instead. They’re feigning sympathy while people’s lives and property are going up in smoke. This is totally unacceptable. California families are suffering trauma and harm because of a bad state government. If 2017’s fires weren’t enough, will you demand that California’s Democrat politicians stop claiming that year-round wildfires are “the new normal”? Don’t let them deceive you. What if politicians claimed there was nothing they could do to prevent violent crime? Candidates running for state office in California need to answer this question: “What will you do to prevent wildfires?” If they blame “climate change” or just say more funding is needed, this election year is your opportunity to fire them or replace them due to their lackluster attitude about wildfires that are directly harming California families. 1. Publicize and impose new stiff penalties, including prison time, for people who cause wildfires either through neglect or pyromania. Since uncaring transients and evil boys and young men are likely perpetrators of most of the California wildfires, every government “homeless” agency needs to hand pamphlets to every transient they see and every government school must drum into the heads of children why we need to “love our neighbor” and why setting fires is wrong. Church schools can and should add fear of God and that God is watching. 2. Clear out dead trees, bushes and brush from all “public” lands in California. Get rid of this dry wood and grass that easily spread fires, because an ounce of prevention is worth a pound of cure. Do it despite the opposition of “environmental groups,” which apparently value dead plants more than live people. 4. Purchase many more planes and helicopters that can fight wildfires better and faster. This can be done using existing funds, but liberals are loathe to cut government waste, aren’t they? Republican state legislators should introduce bills cutting waste, fraud, and abuse and spend the saved money on a new quick-response, wildfire “air force” for California. Even if the ruling Democrats kill these Republican bills, the Republicans could publicly pressure the Democrats to come up with their own bill to buy more planes and copters and station them in high-risk areas of the state. Bottom line, Californians of all political stripes need to demand that our elected officials PREVENT wildfires in the future, and stop irresponsibly excusing themselves because the official fire report reads “cause unknown.” It’s like a corrupt and lazy police force that never names or arrests suspected criminals! As many as 90 percent of wildland fires in the United States are caused by humans. 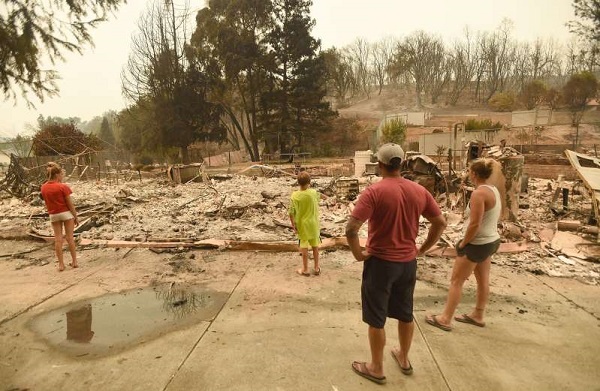 Human-caused fires result from campfires left unattended, the burning of debris, negligently discarded cigarettes, and intentional acts of arson. This entry was posted on Wednesday, August 1, 2018 at 7:54 am	and is filed under California Governor, California Legislature, Democrats, Election, Fighting for what's right, Good Government, Good Science. You can follow any responses to this entry through the RSS 2.0 feed. Both comments and pings are currently closed.